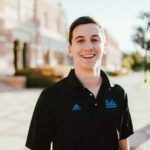 UCLA student Dylan Thomas unleashes a fiery energy blast. WESTWOOD—Second Year Dylan Thomas, member of UCLA’s Fighting Foot martial arts club, shocked and amazed fellow club members by unleashing an energy blast from his hands during routine warm-ups yesterday. Long thought to be just a product of Dragon Ball author Akira Toriyama’s imagination, Thomas’s “chi blast” is the first to be recorded in western history. Despite concerns of police officials, the only property damaged by Thomas’s unintended blast was a small tree, which was reduced to a smoking stump. Club officers have had success helping Thomas repeat the feat, this time in a carefully selected open area. At press time, Thomas’s accomplishment is being analyzed by his fellow martial artists, who are seeking to add the technique to their repertoire. He is also a subject of interest of biology and physics students, who are wishing to be the first to canonize chi manipulation in a new field of study. “Truly, there is no more refined or more honorable way to blow things to smithereens,” said one of the fighters studying the move. In recent reports, Japanese international students have said they are unimpressed.